The late 19th century was a time of huge innovation in printing and publishing. In the 1880s alone, several hundred patents were granted to scientists and industrialists trying to develop efficient printing machines. 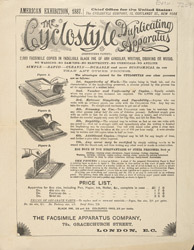 In 1881, an American called David Gestetner invented a simple stencil perforator that he called the Cyclostyle. It used a pen with a miniature toothed wheel on the end. The wheel rolled along the page in line with the pen, punching tiny perforations in the sheet to create a stencil. The stencils were then inked and pressed with a roller: a messy but effective means of duplication.